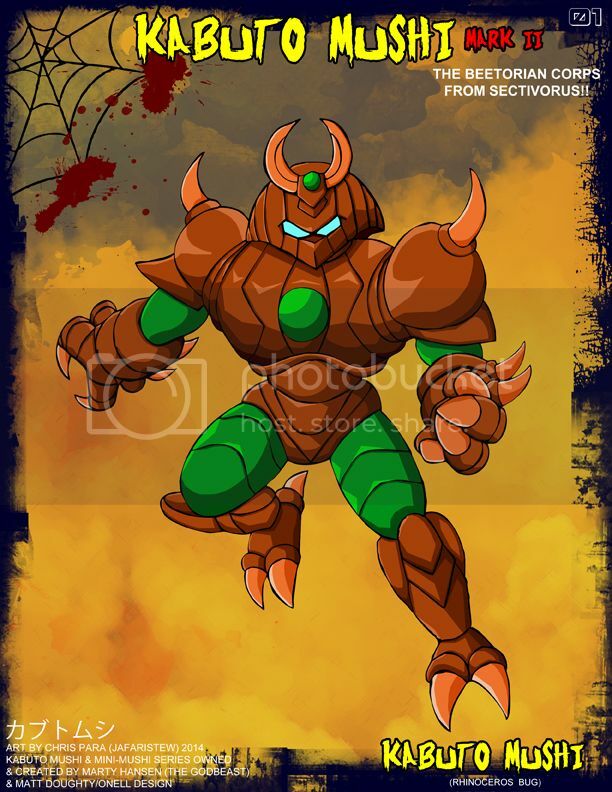 Marty has created the naming of the series Kabuto Mushi, Beetorians, Sectivorus and some of the other ideas that my own have spun off of, I have named the individual characters (besides Kabuto Mushi) and came up with some ideas about them. 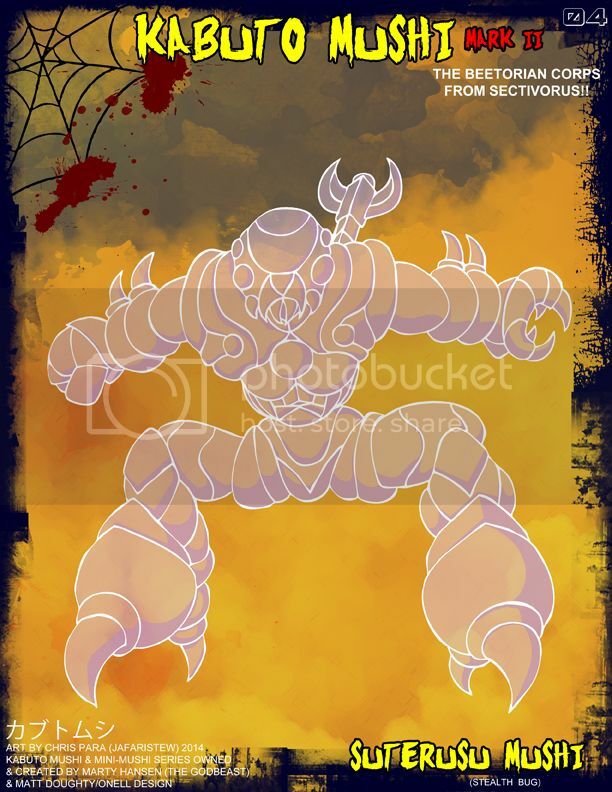 KABUTO MUSHI: The Hero of our tale, a powerful warrior, a born leader, & diplomat who has made many sacrifices to keep the Beetorians a free & powerful race in a hostile world brimming & overgrown with mutated insect life. He is very strong, skilled with weapons, & has a deep sense of honor & loyalty. He believes in the classic Beetorian ways that have been handed down thru the ages & is the 2nd to call himself "Kabuto Mushi." He is both kind, intelligent, & respected by friend & foe alike. He and his "Beetorian Corps" are the peacekeepers of the planet. His body is in the "samurai" configuration, a form that is earned & the highest ranked visual display among civilized Beetorians. RIBSASU: Kabuto Mushi's right hand Beetorian Corp member & confidant, he acts as a scout, decoy, & body guard. Although good-natured he can be hot tempered at times, yet always remembers his true cause & honor. 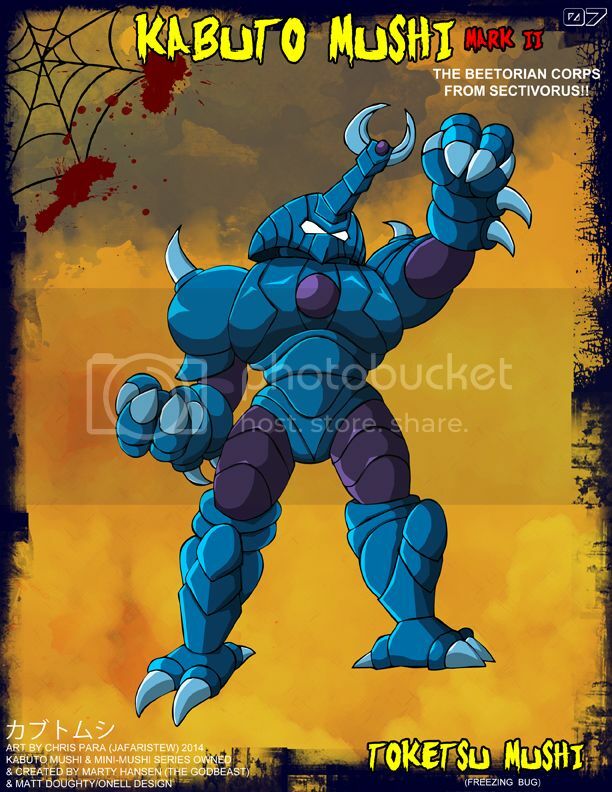 He is a trustworthy long-time friend that is fiercely loyal to Kabuto Mushi. He takes risks & his courage knows no bounds. He has chosen a more mechanized configuration, but due to his smaller stature in this form, many underestimate his actual power & skill. 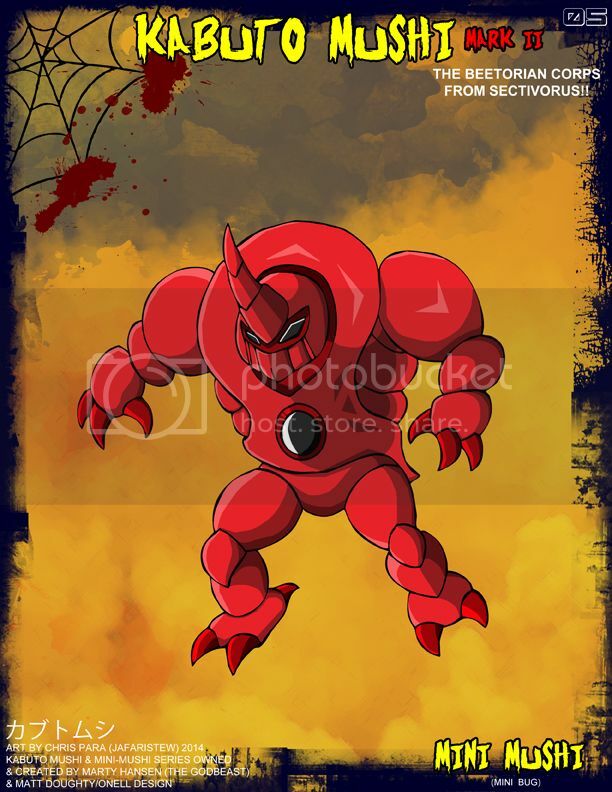 AKA SASORI: The mighty Red Scorpion General, considered a extremist upstart & villain by many in the Beetorian race. Aka Sasori believes that a new world order is at hand, and is taking his armies and invading colonies, tribes, and hives to gather more support & supplies by force and suppress, imprison, or destroy those who do not share his vision. He believes that the home world is in danger, and that alien beings are planning an ultimate invasion(s), and wants to unite the Beetorians into a strong military force to defend their home from interstellar attacks, but many believe that his unjust tactics are more of a quest for absolute power hidden by his alien agenda as a guise. His configuration represents what he sees as the most powerful form for an individual Beetorian, & he is at odds with Kabuto Mushi. SUTERUSU: A fierce and powerful warrior, he possess the unique ability to become nearly invisible due to his stealth-like biology. 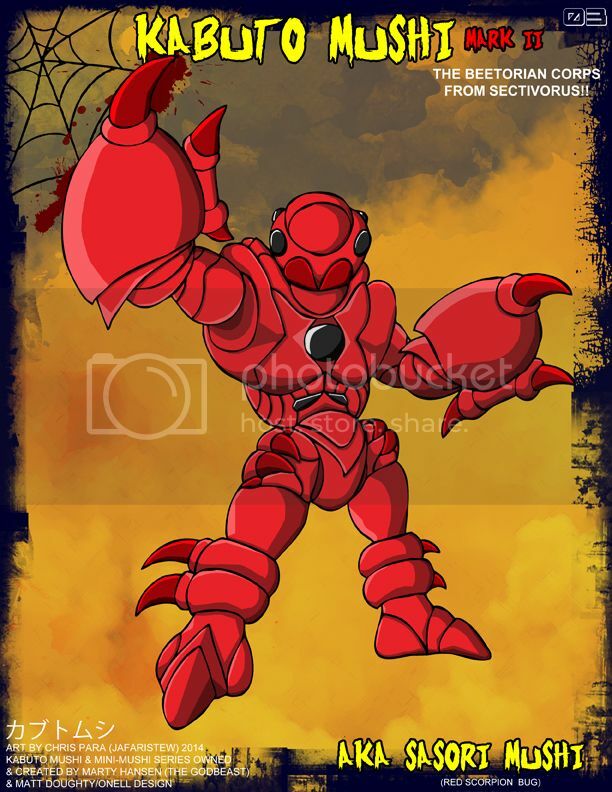 Many have theorized that he is a product (or fluke) of the Red Scorpion General's military scientists, as his ability has not been seen in any other Beetorian's (other than his Mini Mushi sidekick). Although he stands with a usually quiet & collected demeanor he will strike viciously at any moment & many question his actual sanity. His deep voice and unsettling presence are unmistakable to his allies but are often unnoticed by his (fallen) foes. His configuration is quite large by individual Beetorian standards and can be intimidating to even the most experienced warriors when his faint outline is actually seen. So my version of Sectivorus is an alternate or futurish state of Earth that has been transformed due to global warming, severe storms, wild fires, oxygen levels rising, & the bird population being destroyed. It is now inhabited by the evolution of insects into the giant KMMII (a insect hybrid w/transformable exoskeletons) which have replaced humanity (who's survivors are now living underground/or are in hidden stasis due to the harsh state of the world) & the start point of the story would be what is formally Japan, but would eventually expand to include alien worlds. 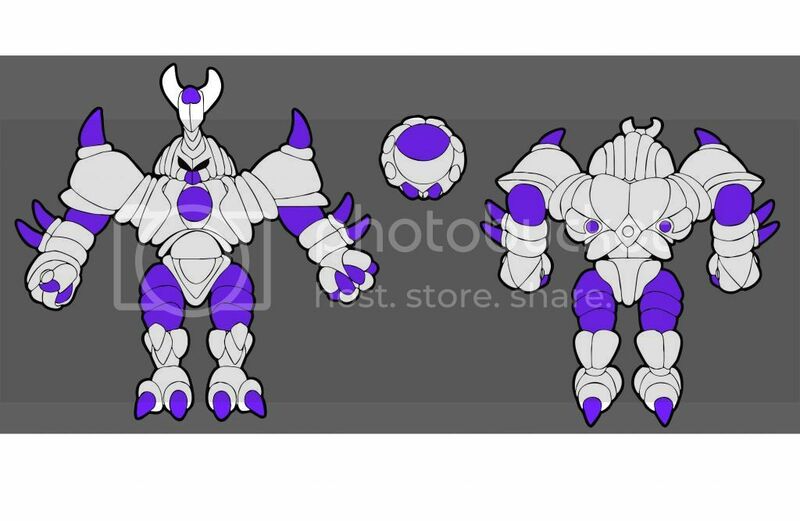 The KMMII have societies/hierarchy, alliances, communication, do battle, and will be fighting other visitors from the Glyos system. The art is drawn from my collection & the configurations that I make from the ideas presented on the boards & official media with the colors I like in those configurations. The backing art is inspired by the 80's toy line "BugMen of Insecta" card packaging. MINI MUSHI: Mini Mushi's are the workers of Beetorian society. A subspecies of Beetorians, they do not grow as large or as complex, and they have only a single display form. Like Beetorians the majority of the race is male, with females being uncommon, & more protected due to their rarity. All of the day-to-day tasks from food gathering to building, to 1st line of defense are a part of the Mini Mushi's role in Beetorian Colonies. 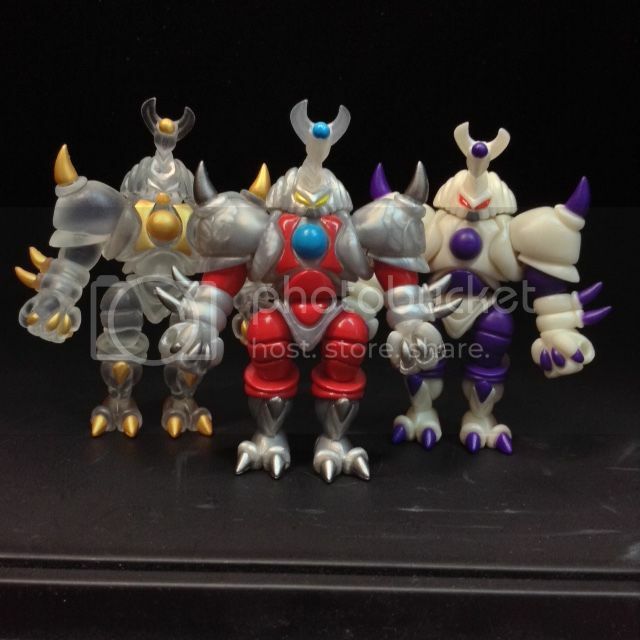 At least 1 Mini Mushi shares a Telebond with a matching color Beetorian, due to this phenomenon, a Beetorian can Telebond communications with their sidekick Mini Mushi who can communicate telepathically with other Mini Mushi's of the same color division and they will act as a single unit under the Telebonded lead Beetorian's command. A "Swarm" of Mini Mushi is considered 4 or more, and they are fully capable of taking down a unseasoned Beetorian in a fight, acting as a single minded unit. Although smaller than humans, enemy Mini Mushi swarms are the main reason that what remains of humanity has moved underground and no longer can inhabit the topside of the earth. GAIJIN KUROKAMI: In the future, the young human girl known by the Beetorian's as Kurokami (Japanese for black hair) was once a USA historian fluent in Japanese & teaching English in Japan under the JET prgramme. When on a field trip to a research lab on Mount Fuji, the increasing changes in climate over the decades eventually caused a violent eruption, forcing the lab facility occupants to take shelter. A brave Japanese lab tech, who felt that a foreigner should not die away from home, pushed "Kurokami" into one of the state-of-the-art life support systems on the lab site. The lab was covered in molten rock and debris from the eruption, but the 6 pods survived intact within the underground chamber in a form of suspended animation. 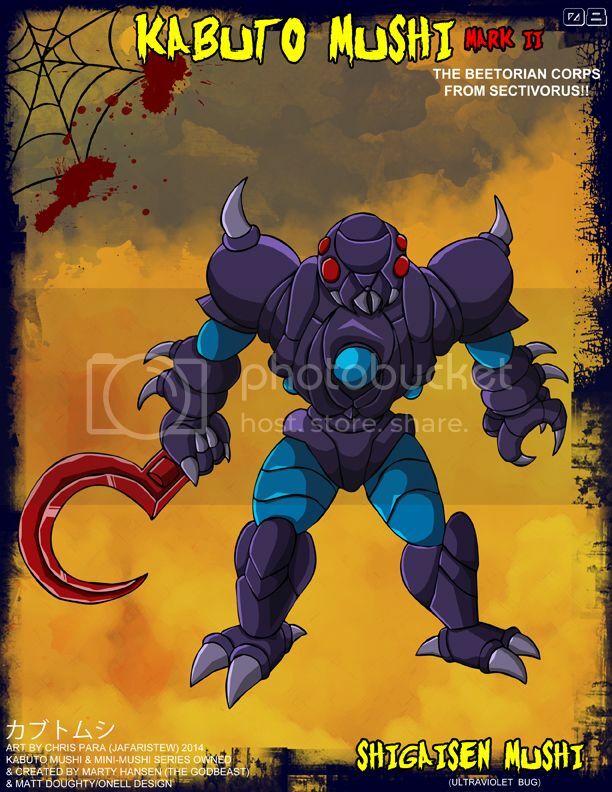 After countless years of evolution, a battle with the Beetorian corps unearthed the lab, and the battle destroyed all of the pods accidentally except for Kurokami's. Feeling a sense of duty to all life, Kabuto Mushi managed to save Kurokami's suspended body from the wreckage and she was brought back to health within the Colony, although with amnesia. She can remember history & events but not her personal information or past life. Kabuto Mushi decided that she was a valuable asset as a historian of what-was-then-Earth (to educate the Beetorians about human's mistakes) & a friend. Many do not feel the same way about the Gaijin (outsider) & Aka Sasori has often made boasts of having her as a meal & often refers to her as Yochu (larva) or Ujimushi (maggot). 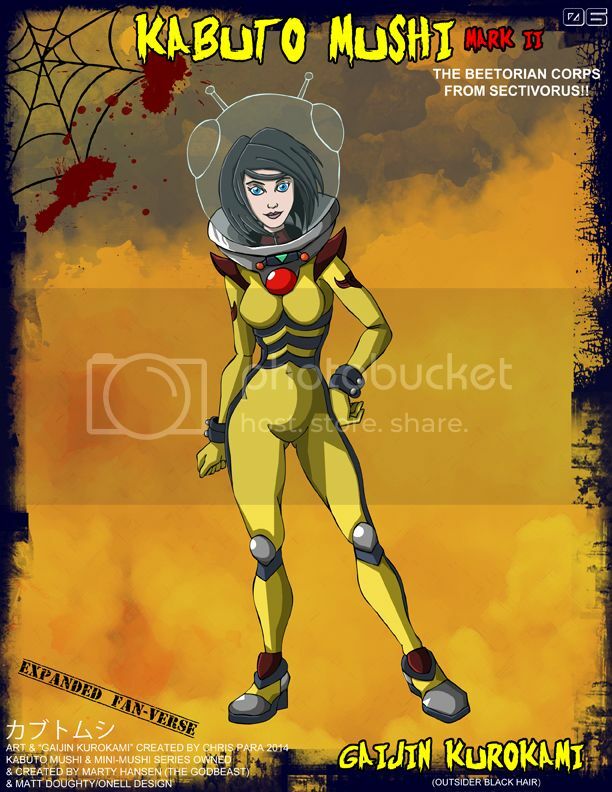 She still wears her (now more fitted & customized) suit from her life support unit, (which is almost insectoid-like in appearance, an endearing trait to Kabuto Mushi himself) & although their is plenty of oxygen, it is more to shield her from (at times) the unstable climate. She has heard whispers that some humans still exist but they are no where to be found on land, and hopes that one day she reunite with them & bridge the race of heroic Beetorians and existing humans together peacefully. *Kurokami is a character I made myself to demonstrate the human element to the chaotic world of Kabuto Mushi, she would serve as our view into the hostile world of Sectivorus. I don't plan on adding many fan-made characters, but would like to someday include the 80's cult line "Bugmen Of Insecta" toy characters that I will eventually recreate using the KMMKII parts! 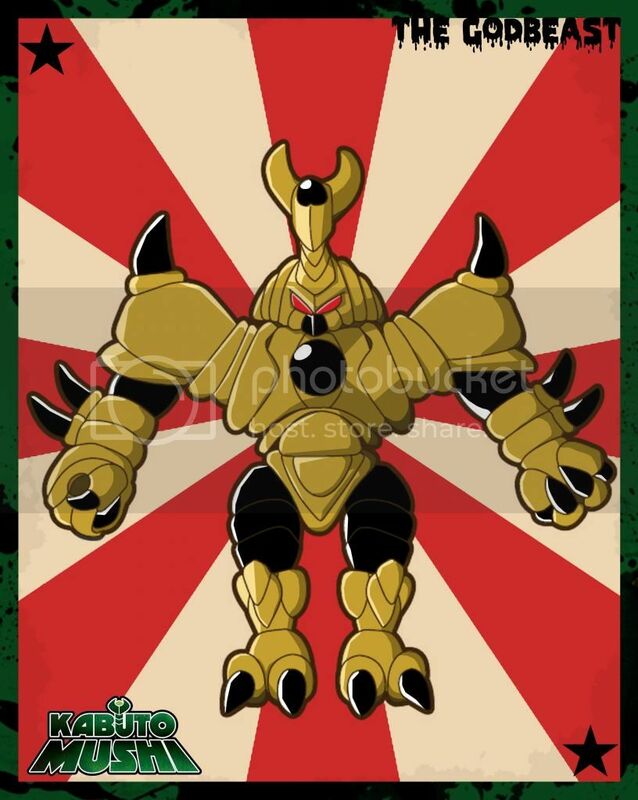 TOKETSU: The mighty Beetorian of the cold north, brother of Shigaisen, & ally of Kabuto Mushi. Toketsu has led a heroic life, he has worked hard, demonstrated patience, and has gained respect in leadership within his colony. Living on Mount Fuji he has seen many battles due to the military advantage point of that location. Toketsu has made many wise choices & allies to get to his rank & standing, all at his brother Shigaisen's dismay, as Shigaisen can't understand why he has not had the same success, as he considers them brotherly equals, but Shigaisen does not care for virtue, nor trust, nor does he value life, the opposite of Toketsu's personal and military strategies. 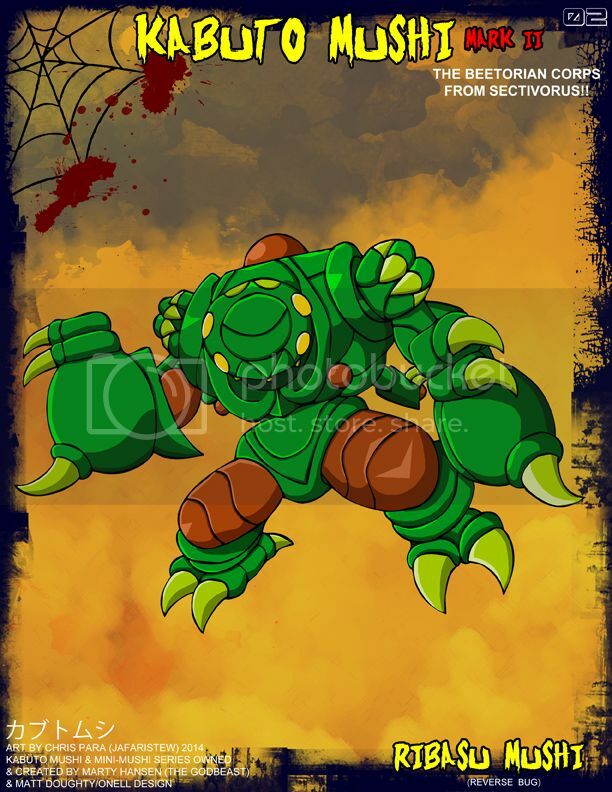 Toketsu's hard shell can handle the most extreme temperatures of cold, & he is as handy with a blade as he is a blaster. He displays himself in the "Tall Samurai" form, one of the highest ranking forms for a Beetorian & usually only used for a commander or leadership form within the Beetorian race. SHIGAISEN: Toketsu's jealous sibling has nothing but contempt for his brother & the Bettorian Corps cause. Although cunning & bright, he acts the fool as Onikisu's right hand man. Seeing as Onikisu is a famous Gladiator, just by being seen with him, Shigaisen believes he is equally as famous, a plea to match his brother's worth in Beetorian eyes. He fights with a ferocity and has no mercy. His weapon of choice is a Empyrean hook that he finds can easily crack the shells of his Beetorian enemies. Shigaisen has been gifted with extreme type of fast fwd vision, where he can see & intercept motions before they happen by the energy that an opponent emits, this gives him a distinct advantage over his enemies, and why Onikisu uses his gift in interpreting their battles with telepathic communication. His chosen form is considered a mockery of the similar samurai forms, as it is a twisted take on a respected look, by inverting his body and wearing the most savage head display. *I equip most of my Mushi with Spy Monkey weapons, and couldn't resist including the red hook I gave the Metallic Purple Mushi for my art cards (the red is like a perfect match! 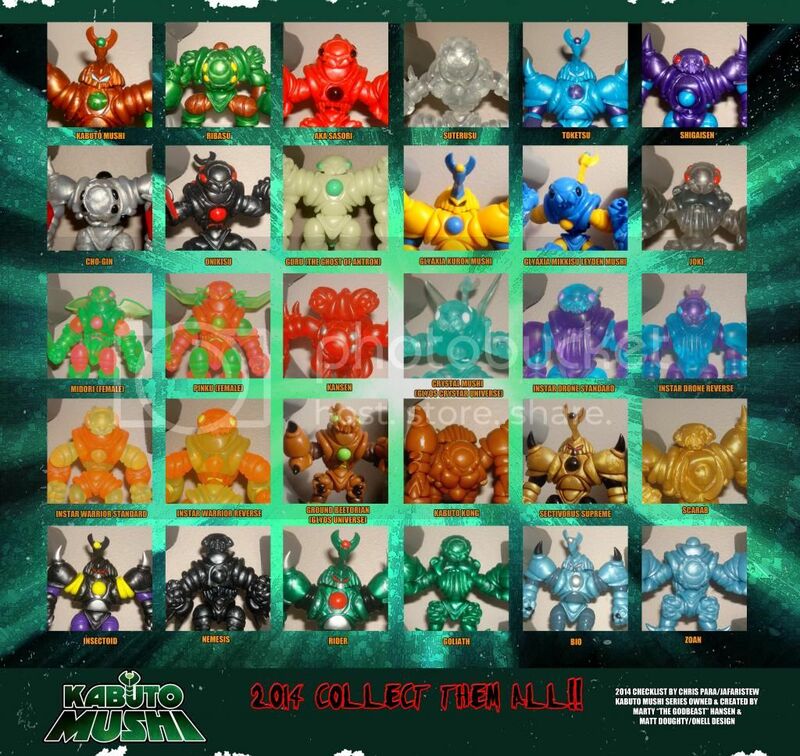 These are my Checklist Posters that I made for the 1st year of the incredible & versatile Kabuto Mushi Glyos figure & it's color variations created by "The Godbeast" Marty Hansen. Photos & graphic design by me. I also used the official logo. The 1st version (on the orange backing) features the solicitation description names, & the 2nd (on the green-blue backing) features my "fan-made" names for the characters in my fan-verse (+ official solicitation names). Special thanks to Marty & the Glyos community for inspiring me and my builds! 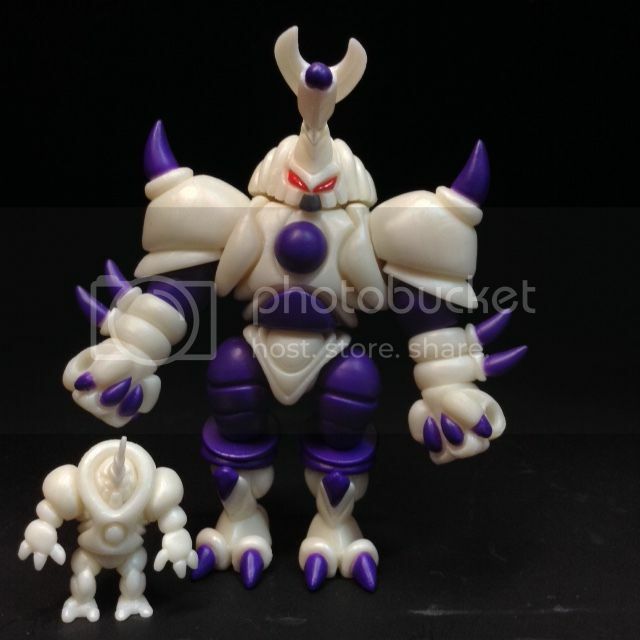 I have the pleasure of being an official part of the magic that is the Glyos Kabuto Mushi. 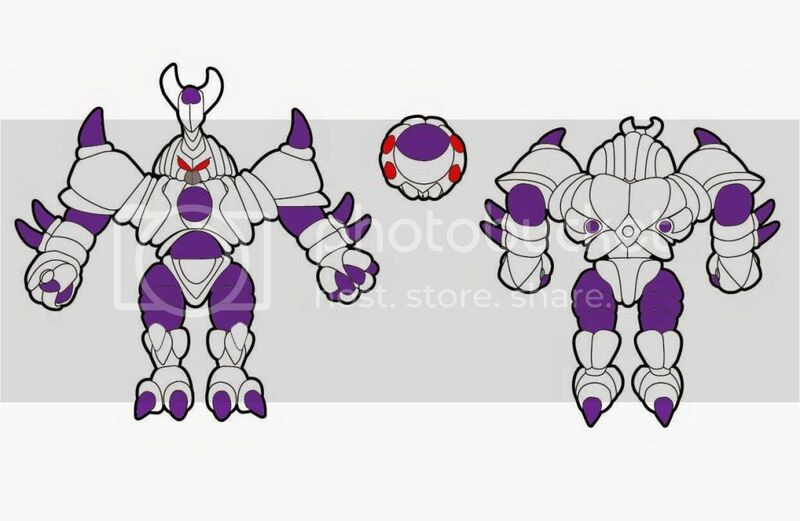 A color concept that I created & submitted to the ultra talented Marty Hansen (aka The GODBEAST) made it to production(called "Galactic Emperor," as Marty related & revised my concept to also be a "Freiza" DBZ homage)! Great artwork on the cards Jafari. 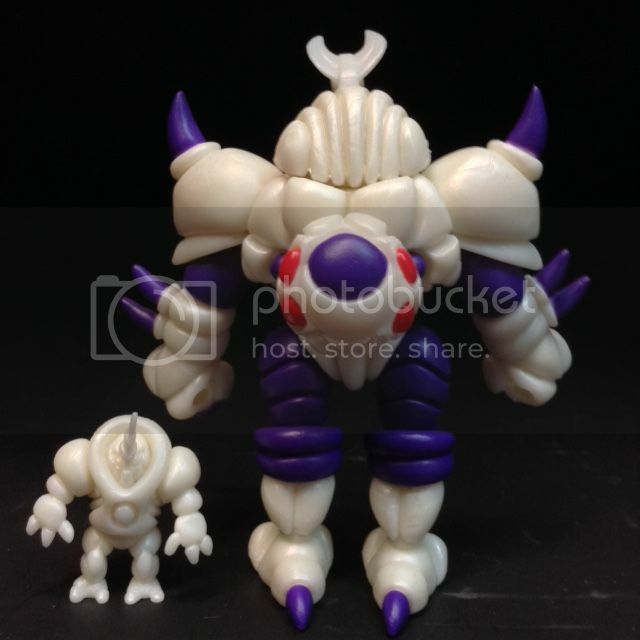 I'd love to see a glyos animated series and your cards fit that perfectly. The Galactic Emperor is also one of my favorites!